Earn Emergency Medicine CME Online! Substantial group discounts are available. "Emergency Medicine Practice is right on target. It's medicine for the real world - the world of managed care, high risk, and lightning-paced clinical advances." Mail & Online Download (+ $9.99 S&H) FREE! You pay only $2.07 per CME credit (just $299 for the whole year) -- less than any other evidence-based CME resource available today! Answer the quick online CME questions. Receive your CME certificate instantly upon completion – and view or print it at anytime from your personalized CME tracker! 12 Monthly Print and Online Issues: Delivered directly to your door and a click away on your computer/mobile device. Your content, your way. Online Issues Library: Access your collection of over 150 issues, growing larger every month. 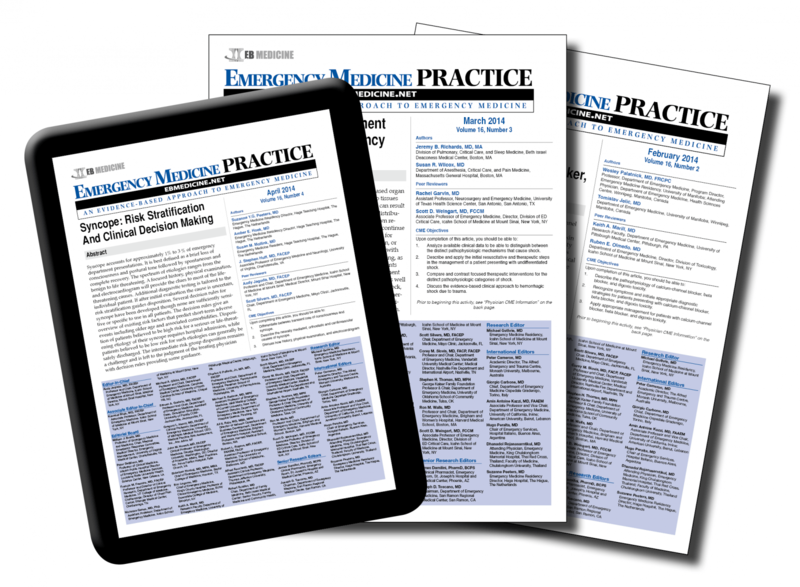 Whether you missed an issue or need more trauma or stroke CME, we have you covered. Online CME: Tests can be accessed whenever you prefer, and you receive credit immediately upon completion. Available credits include 48 AMA PRA Category 1 CreditsTM, 48 ACEP Category I credits, 48 AAFP Prescribed credits, 48 AOA Category 2A or 2B credits, and up to 144 credits for archived issues with active CME. Print CME tests are also included with each issue. Online CME Tracking: We store all your CME records on our website (from Emergency Medicine Practice and other sources), so you will have all your CME data in one easy place. Accreditation: EB Medicine is accredited by the Accreditation Council for Continuing Medical Education (ACCME) to provide continuing medical education for physicians. This activity has been planned and implemented in accordance with the Essential Areas and Policies of the ACCME. Credit Designation: EB Medicine designates this enduring material for a maximum of 48 AMA PRA Category 1 Credits™ per year. Physicians should claim only the credit commensurate with the extent of their participation in the activity. Faculty Disclosure: It is the policy of EB Medicine to ensure objectivity, balance, independence, transparency, and scientific rigor in all CME-sponsored educational activities. All faculty participating in the planning or implementation of a sponsored activity are expected to disclose to the audience any relevant financial relationships and to assist in resolving any conflict of interest that may arise from the relationship. In compliance with all ACCME Essentials, Standards, and Guidelines, all faculty for this CME activity made a full disclosure statement. This information will be presented as part of the course materials. Commercial Support: Emergency Medicine Practice does not accept any commercial support.